Herb Caen was a well known San Francisco Chronicle columnist famous for his "three dot journalism" because of how he separated his little scoops when writing his gossipy tidbits about the San Francisco scene. 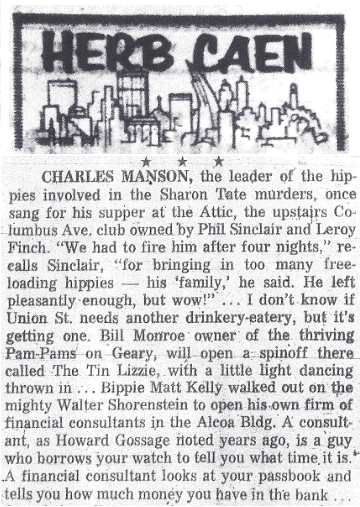 Charlie is mentioned in Caen's Dec. 17, 1969 column just a few days after he was charged in the Tate LaBianca murders. Note the early reference to his 'family'.